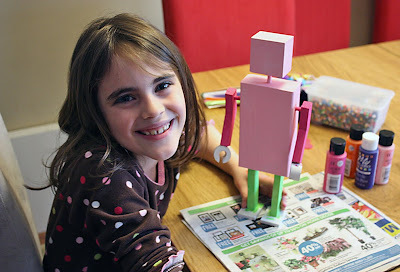 Lana had a class assignment that required creating a robot! 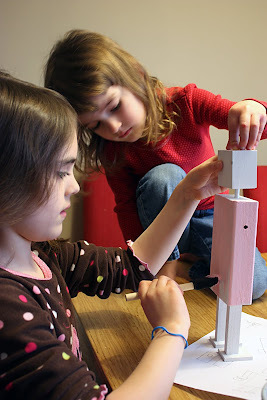 They read a story about a robot in school and then they could either build or draw one of their own. 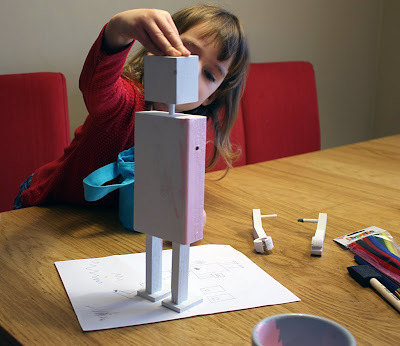 Lana expressed dreams of a wooden robot with movable arms and curly antennas so her Dad went to work helping her plan come to life. 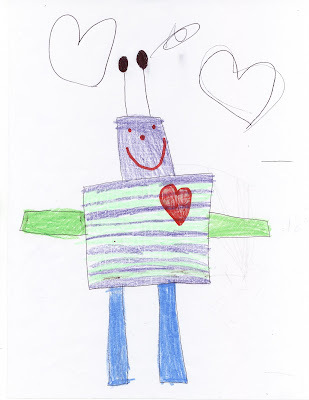 First she drew a picture of her robot. 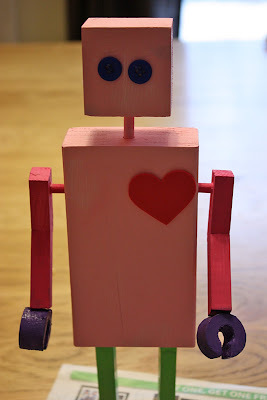 Dad created a little wooden robot according to Lana's design and then it was time for decorating! Lana picked out all the colors she wanted for her robot. The arms were magenta, the legs green, and the hands and feet were purple. 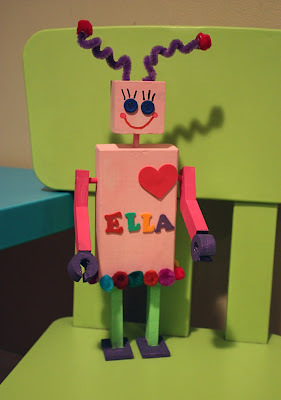 Next, the robot gained a name, Ella. Lana said she loved that name and maybe someday she would like to have a daughter with that name. Ella also got a heart and a couple of blue button eyes. Last, Ella gained a personality! With curly antenna, eyelashes and lots of colorful pompoms! Lana has to give a presentation on her robot. She must tell the class it's name and what it could do if it was a working robot. play hide and seek and because Ella was so good at being quiet she would be the best hider ever! Besides the "best robot ever" part, that list sounded a bit like she was talking about me! I asked Lana if I could talk Ella into doing the dishes and maybe the laundry, also. Lana replied, "O.K. but she's not real, Mom."